Back in the days before we expected Handel’s oratorios to be staged as operas, the smart comment was always that they were essentially the same thing; because the Church decreed that operas could not be staged during Lent, Handel instead tackled biblical subjects and had his singers stand still. These days it’s less easy to be so glib, since staged presentations of oratorios have become fairly frequent. The real turning point came in 1996 with Peter Sellars’s production of Theodora for the Glyndebourne Festival. This season at the same house, Barrie Kosky’s 2015 staging of Handel’s 1739 oratorio Saul has been revived. It is a rather different kettle of fish. 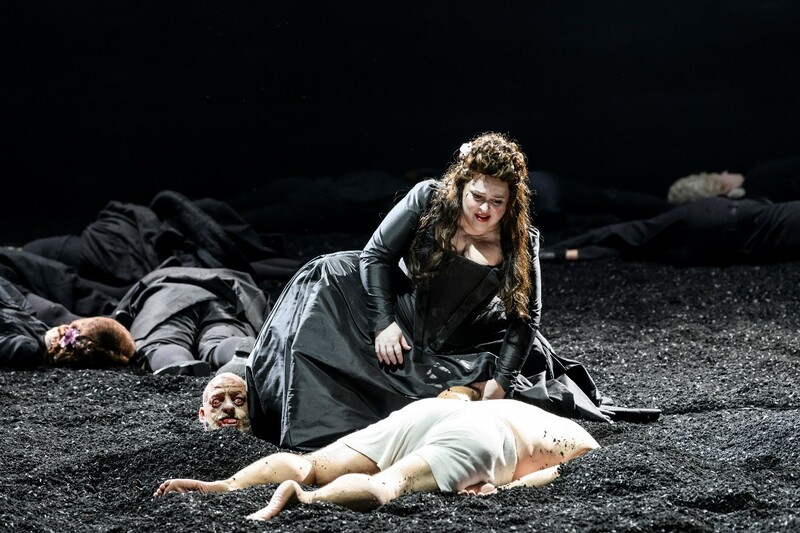 Where Sellars’ presentation was often ritualistic and monumental, Kosky aims for a high level of energy on stage from start to finish. Designer Katrin Lea Tag’s costumes tap into the grotesquery of the great English pictorial satirist James Gillray, evoking the era of George III, just after Handel’s death. Clearly Kosky wants us to draw a parallel between King Saul, driven out of his wits by the extravagant praise directed at David after the young man’s slaying of Goliath, and King George, stricken by long bouts of mental illness. We see the mad Saul with his head shaven, a feature of the treatment of George III that Gillray did not shrink from mocking. But I’m not convinced the comparison takes us very far—even though it was reinforced in this cast by the slight German accent of baritone Markus Brück. The acting style is barnstorming throughout, often to the detriment of the singing. At the performance I saw (Jul. 19) Brück’s Saul began by telegraphing angry, meaning a lot of barked syllables. Madness then brought us a mixture of snarls and howls—not so much King Saul or even King George, more Pirate King. And that’s the point. If you can’t believe in the characters or the drama, sacrificing singing for acting (often both justified and desirable in genuine opera) only makes the experience worse. But don’t blame Handel, he didn’t write Saul for the stage. It is difficult to comment fairly on the vocal qualities of any member of the cast, since their instructions were clearly to concentrate on exaggerated emotion. Previously I have greatly enjoyed the amplitude of Iestyn Davies’s countertenor and his silky legato, but singing David, his top notes seemed lurched-at and hooty. As Saul’s daughter, Michel, Anna Devin gave hints of a nicely etched, hot-toned soprano, but there were wild moments. 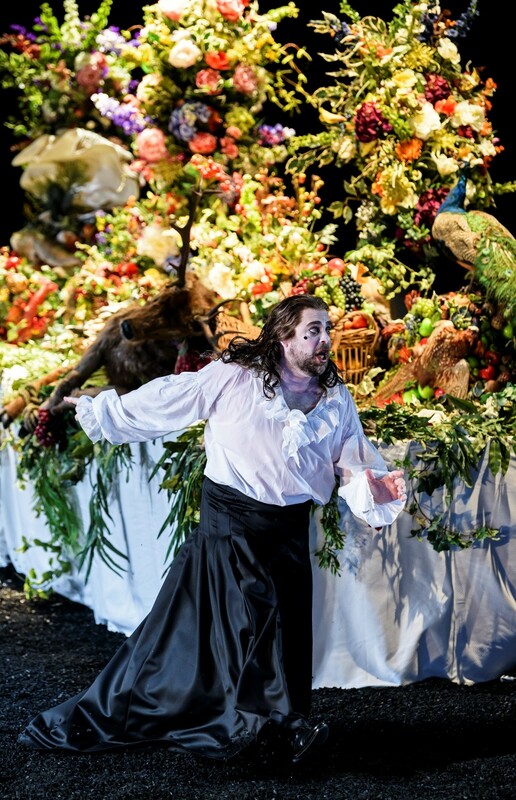 Allan Clayton, who played Jonathan, has an attractive, clean tenor, used to good effect in the later and more sedate arias; but he needs no second invitation to overact. The most consistently beautiful singing—indeed, thrillingly so—came from Karina Gauvin, as Michel’s sister, Merab. She seemed to have negotiated with Kosky that one shouted word per aria was enough, and soon managed to dispense with even that. Such depth of tone, such consistency of line, such refined and expressive phrasing! Completing the cast were Stuart Jackson in a variety of tenor roles, stylishly delivered, and—as if there were not already enough tenors in Saul—John Graham-Hall, endowed with prosthetic breasts to play an androgynous Witch of Endor in place of the usual female singer. The Orchestra of the Age of Enlightenment played magnificently for conductor Laurence Cummings, whose period style happily does not eschew long-breathed phrasing. 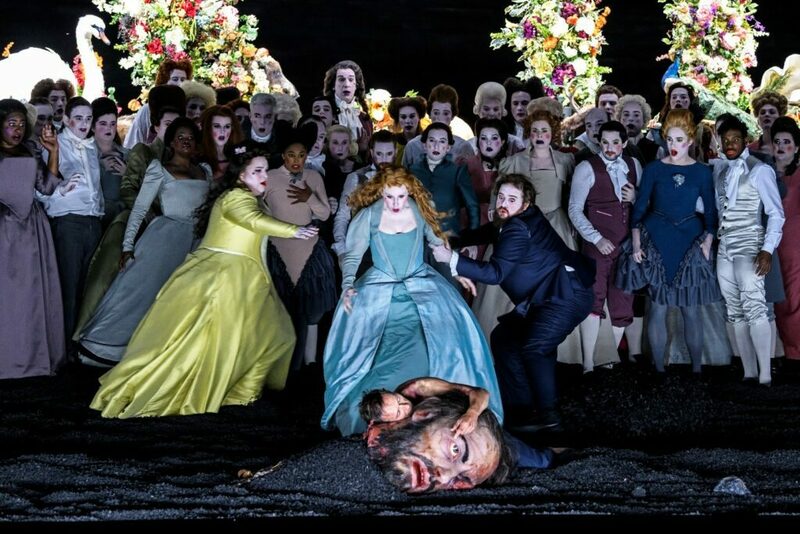 And the blazing Glyndebourne Chorus raised the roof, putting us in direct touch with Handel’s spirit in a way that Kosky’s production, for me, did not. I should report that the audience seemed to love it. They adored the dancers performing the sort of routines that used to be seen on 1970s TV variety shows (courtesy of choreographer Otto Pichler). They gave an ovation to the organist rising through the stage and spinning in mid-air, Liberace-fashion. But I was left thinking that, perhaps, oratorio isn’t opera, and opera isn’t circus.